Attenuation is defined as the decrease of a property of a substance, in this case density or specific gravity. Brewers most commonly refer to apparent attenuation — the decrease in the specific gravity of the wort during fermentation as the yeast convert the sugars to alcohol and carbon dioxide — when describing the degree to which a wort has fermented. Achieving a proper level of attenuation is important for any beer, but there are some types for which it is particularly important. In big beers, proper attenuation is important because under attenuated beers can be cloyingly sweet. In beers such as Belgian Tripels, a low finishing gravity is required — despite the high original gravity (OG) — to get the proper character for the style. And finally, dry beers — including many thirst-quenching summer brews — need to attenuate beyond the level of most “normal” beers to be as refreshing as possible. Poor attenuation is the bane of many homebrewers. Homebrew forums on the Internet and homebrew shop workers both get a steady stream of brewers complaining that they did not reach their expected final gravity (FG). Generally, when brewers experience diminished attenuation, there are two likely causes: low wort fermentability or poor yeast performance. Low fermentability can be a result of the ingredients or, for all-grain brewers, hot side processes. It could be a malt extract with a high percentage of unfermentable dextrins, or too high of a mashing temperature. Poor yeast performance is generally a result of poor yeast preparation, but it can also be due to the wort environment. You can track your attenuation by using a hydrometer or a refractometer. A hydrometer measures the specific gravity — the density of a solution, relative to pure water — by buoyancy. The higher the specific gravity of a solution, the higher the hydrometer floats. A Brix refractometer measures the concentration of sugar (specifically sucrose) in a solution, based on the refraction of light. The higher the sugar concentration, the greater the angle of refraction. where AA is apparent attenuation and OG and FG are the original and finishing gravities, respectively, expressed in “gravity points.” For example, if a beer’s OG is 1.050 and it finishes at 1.010, then the apparent attenuation is (50 – 10)/50 = 80%. The actual attenuation (called real attenuation) is less than the apparent attenuation because the density of alcohol is about 80% that of water. (In other words, the more alcohol in solution, the lower the hydrometer floats.) If you had a 1.040 beer and achieved 100% real attenuation — in other words, if the yeast consumed all the sugars (and other solids) in the wort, leaving only water and ethanol — the final gravity of the beer, as measured by a hydrometer, would be about 0.991. (This corresponds to the roughly 5% alcohol by weight.) The apparent attenuation of this beer would be 122%. Of course, another way to approximate specific gravity from °Plato is to simply multiply by 4, but that approximation gets worse at higher specific gravities, to the extent that it’s not very helpful over 13 °P. Refractometers are great for measuring wort OG, but once fermentation has started, the rising alcohol percentage changes the reading and you won’t get an accurate answer to your attenuation question. An equation to measure alcohol by volume with a refractometer still requires a hydrometer reading. In short, measuring your wort gravity with a hydrometer before and after fermentation will allow you to easily calculate apparent attenuation. In most “normal,” all-malt beers, apparent attenuation is in the neighborhood of 75%. This gives us an extremely quick and dirty way to estimate FG to within a few gravity points — just divide the OG by 4. (For example, for an OG 1.048 beer, the estimated FG would be 48/4 = 12, or an FG of 1.012.) For a better estimate, most yeast manufacturers give the typical range of attenuation for the strains they sell. The actual degree of apparent attenuation you achieve depends not only on the yeast strain, but on your wort fermentability, pitching rate and other variables. So, how can we control attenuation? There are two main causes: the fermentability of the wort and the performance of the yeast. Wort fermentability can be controlled by the ingredient selection or the mash process. In general, darker malts have lower fermentability and therefore a lower attenuation capability. Crystal malts, especially the darker crystal malts, have had their sugars cooked under higher temperatures, causing them to combine with amino acids to form Maillard products, which cannot be fermented by the yeast. Roast malts like chocolate malt have also had their sugars converted by Maillard reactions to unfermentable flavanoids and such. Sugar adjuncts like molasses can also contain a high proportion of dextrins and Maillard reaction products that contribute lots of flavor, but are not fermentable. It used to be common for malt extract beer kit manufacturers to include these type of adjuncts in their kits for flavor in anticipation of the brewer adding a couple pounds of very fermentable white table sugar; the two levels of fermentability balanced out this way. However, if a brewer were to try to brew an all-malt extract brew with these kits, the fermentability would be comparatively low and the beer would not attenuate as desired. All-grain brewers can run into the same kind of problem due to their malt selection, but also due to their mash conditions. Some malts are specifically designed for low fermentability, such as Briess Carapils™ to enhance mouthfeel and improve head retention. As mentioned, the darker crystal malts and roast malts are less fermentable and a high proportion of these malts will produce a less fermentable wort. But malt selection aside, the mashing process can have a large effect on wort fermentability. Beta amylase is the enzyme that produces the majority of completely fermentable maltose sugar in the mash. Alpha amylase also produces maltose, but many other less fermentable sugars as well. Beta amylase is denatured at temperatures above 150 °F (66 °C). The denaturing process is gradual, but the higher the temperature is above 150 °F (66 °C), the faster it will degrade. One study by Stenholm et. al., showed that the activity of beta amylase was reduced to 10% of its original value after one hour at 150 °F (66 °C). 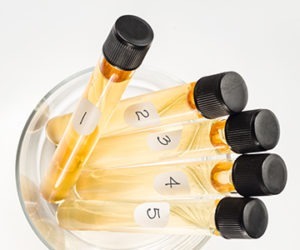 Beta amylase is also affected by mash pH – if the pH of the mash drops below 5, due to acid additions, acidulated malt additions, excess calcium additions and too low a residual alkalinity (RA) for the recipe, the beta amylase will be denatured as well. Generally the mashing process is pretty robust, and the typical single infusion mashing temperature of 152–154 °F (67–68 °C) produces a good compromise of starch conversion speed and wort fermentability. But what if your thermometer calibration is off? Three degrees can make a perceptible difference in the fermentability of the wort. A greater temperature difference, like 6 °F (~3 °C), can have a profound effect if the target mash temperature was 154 °F (68 °C), but is 160 °F (71 °C), the beta will be more quickly denatured and the wort will be more dextrinous, leading to poor attenuation. The health of the yeast and the fermentation environment is the other big factor when it comes to poor attenuation. If the yeast are not healthy or there are too few to do the job, then the wort will not be completely fermented. Yeast always eat the simple sugars first and save the larger sugars like maltose and maltotriose for later. Interestingly, if sucrose is present, the yeast will use an invertase enzyme to break down sucrose into its components of glucose and fructose first, before eating all the other individual glucose and fructose sugars that may be present. Once those sugars are eaten, the yeast will move on to maltose, which should be the majority of the sugar in the wort (>40%). Maltotriose is a three glucose sugar that is fermented to different degrees by different yeast strains. Lager yeast strains generally ferment it more completely than ale yeast strains. Depending on the mashing schedule, maltotriose will make up 10–20% of the wort, and dextrins will make up about 20–25%. Right away you can see that if unfermentable dextrins make up 20% of the wort, that limits your attenuation to 80%, so if the yeast strain or the yeast’s health prevents it from finishing the maltotriose, your total attenuation will be less than you expected. The ability of yeast to completely ferment a strong wort depends on the health of their cell membrane. The cell membrane is different than the cell wall; the membrane is a semi-permeable membrane that essentially serves as the cell’s mouth, allowing sugars to pass into the cell, and waste products to pass out. The membrane also allows the cell to bud and form new cells. As the cell ages, the membrane gets used up and yeast growth and function declines. To build a robust cell membrane, the yeast need oxygen and certain lipids to synthesize sterols for building blocks. So, poor oxygenation of the wort will impair the yeast’s ability to synthesize sterols and ultimately their performance. As a side note, there has been talk of using olive oil to directly supply one of the unsaturated fatty acids that yeast would synthesize from oxygen and lipids in the wort. This would seem to eliminate the need for oxygenation, but olive oil only supplies one of the compounds that the yeast need, so while it definitely helps build yeast mass, it is not a complete replacement for oxygenation at the start of fermentation. Zinc is another critical nutrient that yeast need to fuel their biochemistry, and one that is often insufficient in wort. Modern packaged yeast strains are grown at the manufacturer with complete nutrient blends so that fresh yeast should have sufficient zinc for their first, and probably second, fermentation. However, if you as a homebrewer are consistently repitching from batch to batch, you should add yeast nutrient to the wort to keep the zinc level in a healthy range. If you are fermenting a wort with a high amount of adjuncts, an addition of yeast nutrients might be wise even if your yeast is fresh and healthy. Pitching rate goes hand in hand with yeast health. You need enough yeast to do the job, and if your yeast are only 50% healthy, then you would need to pitch twice as much to do the same job as yeast at peak health. Today’s recipes assume that you are pitching fresh yeast that has been recently grown in a nutrient rich starter. If you are not making a starter and just pitching multiple packs to make up the count and those packs have been in the refrigerator for a couple months, then be prepared for less than optimum performance and a lower attenuation. The beer will probably still be good, it just won’t be quite on target. Yeast performance will also be affected by the fermentation environment. Conditions that are too warm will not impair fermentation and attenuation, but will affect beer flavor, generally creating more fusel alcohols, esters and phenols than desired. Conditions that are too cool will generally slow the fermentation, which may impact attenuation, but ultimately the beer should finish if the temperature is stable and all other yeast factors are being met. Fluctuating conditions, though, can definitely impact yeast performance, and cause them to stop before the beer is finished. Sometimes rousing the yeast by swirling the fermenter will get them going again, but the best way to restart a stalled batch is to pitch actively fermenting yeast at high kräusen from a small starter. The starter does not have to be big — you aren’t trying to grow yeast, you just want them to be active. A single package should be sufficient to finish the job for most beers, but if it is a strong beer, then two packages may be necessary. The ability of yeast to properly ferment a wort depends on the fermentability of the wort and the health of the yeast. Fermentability depends on ingredient selection and your mash conditions. Yeast health depends on pitching rate, levels of aeration, levels of yeast nutrients and yeast viability. As such, homebrewers have many ways to influence the FG of their beer. To achieve very high levels of attenuation, you need to address all of the relevant variables. To brew a beer with a lower level of attenuation, only one variable needs to be tweaked (most commonly, by adding lots of specialty malts or resting at a high mash temperature). Other variables, such as mash thickness, can also play a minor role, but I don’t have the space to discuss that. I wasn’t expecting some sort of Spanish Inquisition.